तीन रंगों के भिन्न-भिन्न संयोजनों के साथ क्वार्कों के आवेशों के मध्य आकर्षण और प्रतिकर्षण की प्रणाली प्रबल अंतःक्रिया कहलाती है, जिसकी मध्यस्थता ग्लुऑन नामक बल वाहक कण द्वारा होती है; इसकी नीचे में विस्तार से चर्चा हुई है। वह सिद्धांत जो प्रबल अंतःक्रियाओं को बताता है क्वांटम क्रोमोडायनामिक्स (QCD) कहलाता है। A quark, which will have a single color value, can form a bound system with an antiquark carrying the corresponding anticolor. 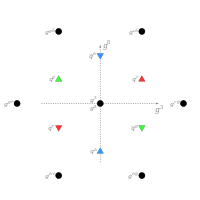 The result of two attracting quarks will be color neutrality: a quark with color charge ξ plus an antiquark with color charge −ξ will result in a color charge of 0 (or "white" color) and the formation of a meson. This is analogous to the additive color model in basic optics. 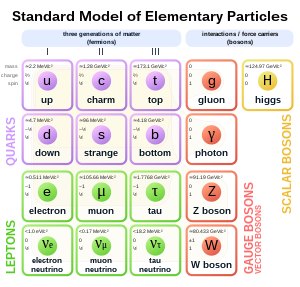 Similarly, the combination of three quarks, each with different color charges, or three antiquarks, each with anticolor charges, will result in the same "white" color charge and the formation of a baryon or antibaryon. ↑ "Quark (subatomic particle)". ब्रिटैनिका विश्वकोष. अभिगमन तिथि 2008-06-29. ↑ R. Nave. "Confinement of Quarks". HyperPhysics. Georgia State University, Department of Physics and Astronomy. अभिगमन तिथि 2008-06-29. ↑ R. Nave. "Bag Model of Quark Confinement". HyperPhysics. Georgia State University, Department of Physics and Astronomy. अभिगमन तिथि 2008-06-29. ↑ R. Nave. "Quarks". HyperPhysics. Georgia State University, Department of Physics and Astronomy. अभिगमन तिथि 2008-06-29. ↑ अ आ B. Carithers, P. Grannis (1995). "Discovery of the Top Quark" (PDF). Beam Line. SLAC. 25 (3): 4–16. अभिगमन तिथि 2008-09-23. ↑ "Weak Interactions". Virtual Visitor Center. Stanford Linear Accelerator Center. 2008. अभिगमन तिथि 2008-09-28. ↑ R. Nave. "The Color Force". HyperPhysics. Georgia State University, Department of Physics and Astronomy. अभिगमन तिथि 2009-04-26. ↑ B.A. Schumm (2004). Deep Down Things. Johns Hopkins University Press. पपृ॰ 131–132. OCLC 55229065. आई॰ऍस॰बी॰ऍन॰ 0-8018-7971-X.